Serving the entire Charlottesville, VA area including Greenbrier, Locust Grove, Martha Jefferson, Woolen Mills, Belmont, Ridge St. Fifeville, Johnson Village, Fry’s Spring, Jefferson Park, Starr Hill, Rose Hill, Barracks/Rugby, Venable, Lewis Mountain, The Meadows, and the suburbs in and around Charlottesville, Virginia. Get a Free Artificial Grass Estimates in Charlottesville, VA: 1-888-507-7960. Welcome to Celebrity Greens Charlottesville: the Authorized Designer and Installer of Artificial and Synthetic Grass Putting Greens, Lawns and Sports Turf Fields for the greater Charlottesville, VA.
We at Celebrity Greens install artificial grass lawns and putting greens that are of superior quality, long lasting and environmental-friendly. We’re the leaders in the synthetic grass industry across North America. We’ve installed thousands of artificial grass projects and synthetic putting greens and we possess the kind of workmanship, experience and synthetic turf products needed to ensure your yard looks amazing and performs like a real grass putting green for years to come. Our lawns and putting greens are environmentally friendly, save you on watering, maintenance and upkeep, and they’re all manufactured in the USA. Unlike many artificial grass installation companies who purchase their turf from cheap Chinese factories, we have partnered with top quality, US artificial grass manufacturers. This allows us to offer you the best quality synthetic grass, designed for your specific needs. Our artificial turf meets the highest standard in artificial grass in terms of appearance, longevity and durability –That means you’ll have peace of mind, a beautiful yard or putting green and we stand by our product with a manufacturer’s 8-year synthetic turf warranty. Our artificial grass is completely lead-free and comes with tremendous environmental benefits including requiring no mowing or fertilizing, our artificial grass installations will save the average home owners thousands of gallons of water, and countless hours of maintenance each year. We can install whatever sports surface you’re looking for, and it will provide consistent ball roll and minimize trips and falls. We also offer padded playground artificial grass surfaces, and we specialize in designing and installing the most advanced sand filled, synthetic grass putting greens you’ll find anywhere. Our artificial grass golf greens can be installed indoors to allow you to use it in the rain, snow, year round… We can also include design features such as water features, sand traps, custom lighting and many other amenities. If you’re tired of trying to maintain a beautiful grass lawn, tired of the constant upkeep, muddy footprints, high water bills, it’s time to install a beautiful Celebrity Greens Charlottesville artificial grass lawn. 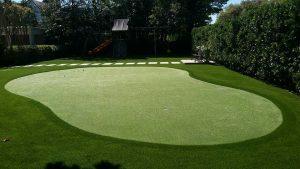 And if you want to have a world-class artificial turf putting green installed in your back yard, to provide you with round the clock access to practice your short game, look no further. Contact us today at 1-888-507-7960 for a FREE Artificial Grass or Putting Green consultation!